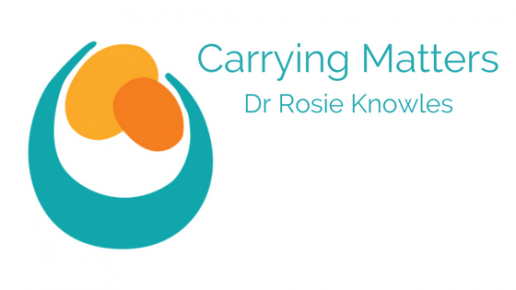 Slings and carriers have been a big part of Emily Wilkins' parenting, over the course of 4 sons who are now aged 22, 9, 7, and 3.5 years. 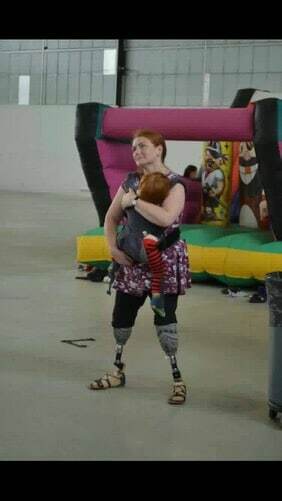 She is a double amputee and is living life to the full! “I’m a double amputee and have the autoimmune disease, lupus, which can affect my joints and my lungs. 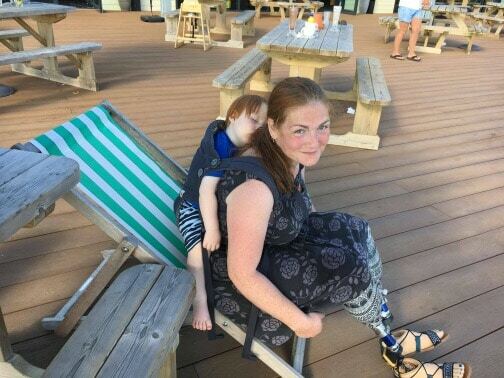 Sometimes I’m well and I can wear while I’m standing and walking, sometimes I’m not well, or I’m having prosthetic problems, and I can wear in a wheelchair, but walking or sitting, wearing my babies and toddlers has helped me to feel more capable and confident in my abilities as a mother, to know that I can respond effectively to meet their needs even when my body is less than cooperative. Sometimes that means having help with buckles when my hands are too arthritic and sore to manage them, sometimes using a stretchy wrap as a seatbelt on my lap, which even works with a great big toddler. 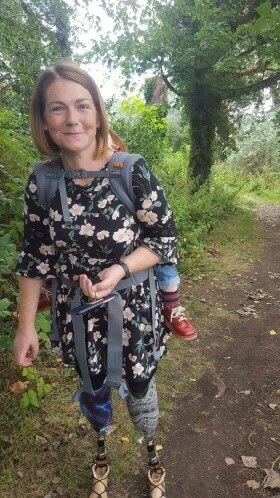 Balance can be tricky when you walk on prosthetics but wearing my babies has given me the most amazing physio programme, as I learned to keep my balance with the huge motivator of having the most precious cargo held close. It helped 2 of my premature babies regulate their body temperature and move out of incubators on NICU. It has kept busy toddlers safe when we venture out. 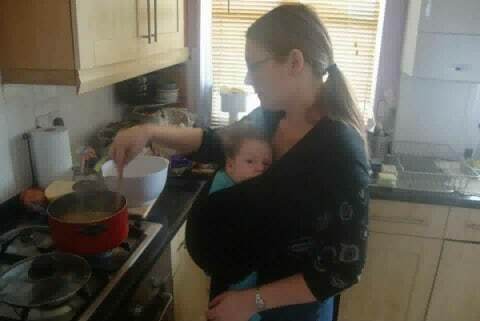 It has meant that even if I need help from someone else when we go out, I am still mummy, I am still able to transport my baby, comfort and hold them close, and feed them easily. 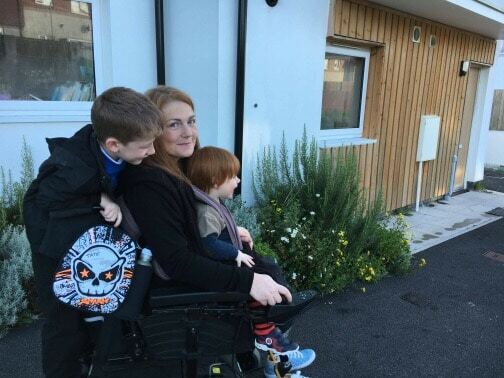 Even when I was stuck at home and couldn’t stand up with them, let alone walk them endlessly up and down, I could get them feeling cosy and close and rock with them. My husband has also been a happy babywearer over the years, always willing to take over when I’d reached my limits and has an amazing bond with his sons. Some of these photos show less than ideal wearing/positioning, either because I’ve loosened straps for feeding or because I didn’t know better, but I’ve learned through experience and advice from others and got more and more confident with time. 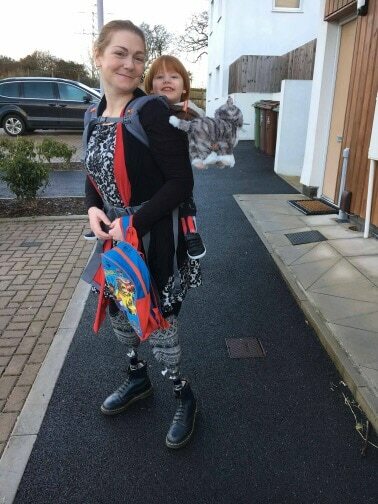 The baby wearing community has been welcoming and supportive of us and it makes me so happy to see more and more disabled babywearing parents forming networks and sharing information and support online. It’s wonderful to know that we’re not alone in this slightly different looking journey! 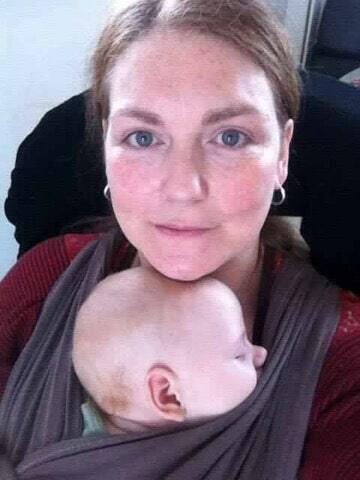 Babywearing has helped us through the tough times and the happy times and I’m so glad we all got to experience it.